On the beautiful island of Mallorca Residence Royale selected 7 exceptional villas for you in the prestigious area around the capital Palma de Mallorca. All villas are located near the beach and command breathtaking views of the Mediterranean Sea. Choose one of our luxurious villas for a great holiday on Mallorca. Holiday villa Cindy lies in a quiet area between Palma and Bendinat on the southern coast of Mallorca not far from the beach. Wonderful holiday villa for 12 with 6 bedrooms, 6 bathrooms, heated pool, sauna, air conditioning, WiFi internet and sea view! Villa La Perla de Andratx is for rent in Port Andratx (Mallorca). This luxury villa with 4 bedrooms, 3 bathrooms, a private pool and airconditioning is located on a mountainside with breathtaking views of the Mediterranean. An exclusive villa on an exceptional location! This ultra modern villa is located on the south-western coast of Mallorca near Cap Falco within walking distance to the beach. Superb modern villa with 4 bedrooms, 4 bathrooms, infinity pool, internet and breathtaking sea view! 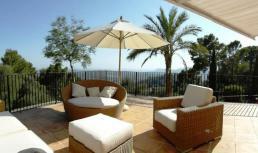 This luxury villa is for rent on a hill near Calvia on the south-western coast of Mallorca. Magnificent villa for 12 with guest house, infinity pool, air conditioning, internet and sea view! Villa Colina lies near the beach between Cala Vinyes and Cala Cap Falco on the southern coast of Mallorca. Splendid, modern vacation villa with 3 bedrooms, 3 bathrooms, private pool, air conditioning, WiFi internet and lovely view of the bay of Palma! 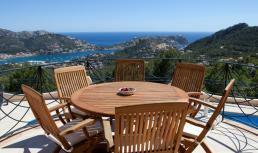 Villa Orietta is located in Port Pollensa, only 200 m. from the beach. Wonderful, modern holiday villa with 5 bedrooms, 5 bathrooms, air conditioning, WiFi internet and private pool! Villa Vincenza is located in Port Pollensa, only 2 km. from the sandy beach. Wonderful, vacation villa with 5 bedrooms, 3 bathrooms, air conditioning, internet and private pool with jacuzzi!